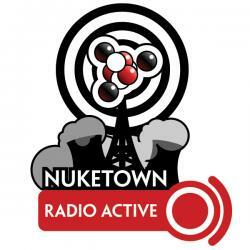 Nuketown Radio Active #72 contemplates the best way to organize a geeky bookshelf, takes another turn at chess with kids, finds out that Neutron Lad has a lot to talk about, and asks questions about Nuketown’s long-dormant RADIATIONS newsletter. Finally I review Dungeons & Dragons 4th Edition, the latest edition of the venerable role-playing game by Wizards of the Coast. NeutronLad gets talking … and talking … and talking. I like 4E, but I don’t love it. I think it’s a bad fit for traditional campaign settings, including Greyhawk and Forgotten Realms and works best with players who are tired of 3E, are looking for something with more focused character options, and are willing to reboot their campaign. The game system is less flexible than it’s predecessor, and unlike 3E players will find themselves forcing their campaigns to fit 4E’s play style, rather than the other way around. If I were starting up a new D&D campaign with a new group of players, I might go with an Eberron 4E campaign (especially once the updated setting is released next year) but for now 4E’s off my active gaming radar. And yeah, I’m tired of arguing about 4E.